Technorati today received a much needed upgrade - if you don't have the time to read that lengthy CEO announcement, I suggest you watch this 5 minute screencast video that touches the new and improved features of Technorati 3.0. One area where Technorati Engineers have applied maximum thought is Technorati Favorites - The service has been totally revamped and is definitely more usable now. You can add new blogs or websites to Technorati Favorites using bookmarklets, Technorati Button or by directly typing the blog URL. Tags can also be associated with bookmarks favorites to further classify them. If you have a large number of favorite XML feeds, they can be imported together into Technorati Favorties using OPML files. Technorati Favorites: What's not so good about them ? Technorati introduced Favorites in their last upgrade - People could easily find out how may Technorati users marked some blog as a favorite but there wasn't any mechanism to know who actually bookmarked the blog. 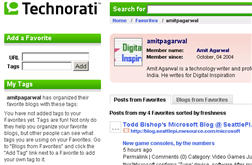 However, things have changed with Technorati 3.0 - All your bookmarks are in public now. Anyone who knows your Technorati Profile name can find out about your favorite blogs. Why this is bad ? Because Technorati never informed users that they were turning their private bookmarks to the public. Lot of us may not feel comfortable sharing our URLs to the world. The worst news is that there's still no option to hide your bookmarks from public. Privacy is compromised, atleast for now. While the goal of Techorati could be that people ditch Bloglines or other news readers and use Technorati itself as the RSS reader, it may not happen just yet. However, the Technorati Feed Reader could appeal to blog readers who subscribe to only a couple of feeds. » Technorati Rank: Who's linking ?